If you're trying to come up with unusual ideas for a birthday celebration or a glamorous night in then you should consider a cocktail night. Although it might sound expensive you don't have to spend a fortune to have a sophisticated evening of classic cocktails. You don't need any experience behind a bar to be able to create delicious drinks that will impress your guests. A few well-chosen drinks that are carefully prepared and garnished correctly will be sufficient. As long as you stick to the recipes and the ingredients exactly, you can't go too far wrong. However, this is very important - if you start free pouring or trying to substitute or add to the list of ingredients it could all go horribly wrong. The quantities and proportions have all been carefully crafted to complement each other and create the ideal taste sensation and they shouldn't be messed about with. 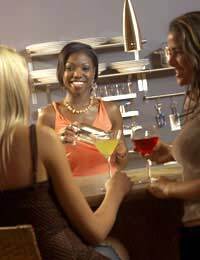 If you're planning a cocktail night, make a real occasion of it and ask your guests to make an effort on the clothes front. Cocktails call for a certain amount of sophistication but just because you're staying in, that doesn't mean you shouldn't make an effort. If you really want to go the extra mile, send out invitations and state a dress code. Whether it's a trestle table, a dining table or just a work surface in the kitchen, you'll need a dedicated 'bar' area for your cocktail night. Get all your ingredients, glasses and decorations ready well before your guests arrive. You should plan to prepare just a few cocktails and do them well. That way, you won't need to buy lots of ingredients that might not get used and you won't be making a different drink every minute. By keeping it simple you can really go to town on the drinks you choose. For example, if you pick a Martini then serve them in Martini glasses and garnish with olives on toothpicks. If you're on a tight budget, you could ask guests to bring a bottle and write a list of the ingredients that are required for the drinks you've chosen. Cocktails can be quite potent and, because many of them contain fruit juices or sweet liqueurs, they can be very deceptive. To avoid any early evening causalities, provide a few nibbles for your guests. This doesn't need to be anything complicated or lengthy to prepare, in fact, the simpler the better. Pizza slices, bruschetta and spring rolls are all quick and easy to prepare and you can bring out a plate or two at a time. Anyway, enough about nibbles, here are some classic drinks to get your evening off to a good start (they all serve one). Pour the ingredients into a cocktail shaker and stir with plenty of ice. Strain the cocktail into a Martini glass and decorate with a green olive. Pour the ingredients into a blender, add a handful of crushed ice and blend until it's a smooth consistency. Pour into a tall glass and decorate with the pineapple slice and cherry. Pour all the ingredients into a cocktail shaker and add some ice. Shake well to combine. Strain the cocktail into a Martini glass and decorate with a lime wedge. Put some salt on a saucer. Dip the rim of a large cocktail glass in water then into the salt. Put the rest of the ingredients into a cocktail shaker and shake well. Strain into the glass and serve.